Just one week before heading out to our next summer retreat in Boracay, the FLOW girls want to do another blog giveaway to all our cool yogi readers out there! Even if you weren’t really into yoga, winning these premium items is good enough reason to start a practice! Don’t you just love free stuff?! We will be giving out a 100% Microfiber XL Hot Yoga Towel and a Nontoxic, Recyclable and Photodegradable Yoga Mat from Yoga Rat thanks to our awesome friends from Aura Athletica! 3. Blog, tweet or Facebook post a photo of yourself in your favorite yoga post preferably out in nature (because we oh-so-love yoga outdoors!). Tag at least 3 friends and include the hastag #FlowBlogGiveaway. Remember to tag @AuraAthletica and @surfyogasamba in your tweets! You may also choose to do all 3 (blog, tweet, post on FB) for more chances of winning. The most creative entry wins! We will be announcing winners through our Facebook fanpage on April 17, 2pm. 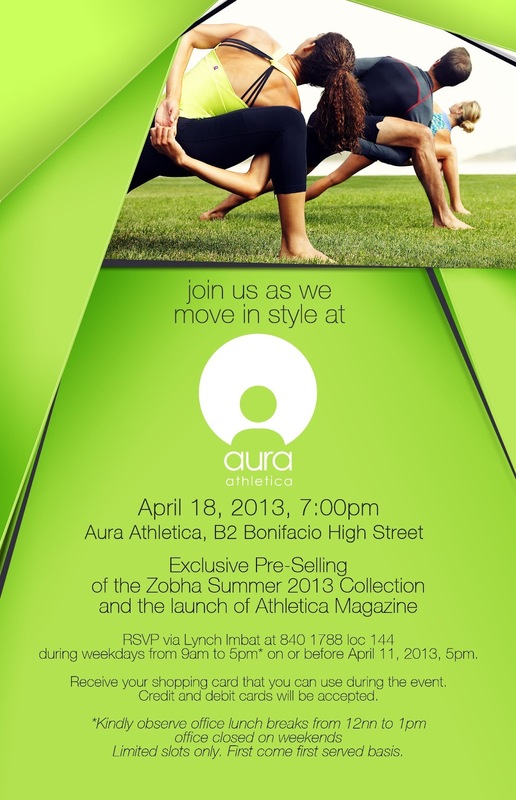 And for those that can’t make it to our FLOW Boracay retreat, do register for the launch of Athletica Magazine and pre-selling of the latest Zobha 2013 summer collection at Aura Athletica’s Bonifacio High Street branch on April 18, 7pm.